XAI - XAI..........I named by Liberian folk tales "Deep in the Bush, Where People Rarely Ever Go" but on this trip through Botswana, I realized that the title wasn't really accurate. There were usually people nearby whenever and wherever I stopped along the roads of Liberia -- especially if I did something really embarrassing. The destination of the safari was Xai-Xai (pronounced Ki-Ki, rhyming with Die-Die). It really was where people rarely ever go. The first hour of the trip was on paved roads with light traffic. Then, on some unmarked turnoff that I certainly didn't notice, we headed into the bush on sand paths and no more traffic. Most of the journey was not marked and it was clearly evident to me that it would have been completely impossible to find Xai-Xai without my trusty guide. This trip was the first time I could recall being concerned that a breakdown could become a life-threatening situation. There was nobody and no help hour after hour. For most of the ten hours the scenery never changed with brush, scattered trees, and very few animals. Once I spotted a herd (gaggle?) of ostriches. Later, and it would have been much nicer if it were sooner, I was assured that even a breakdown wasn't threatening. We were on a schedule. If we didn't show up where we belonged, help would have come looking. Of course, I didn't hear this until after the trip was over. As we drove on to Xai-Xai, I was sure the guide Brigade, as in "Charge of the Light", drove as carefully as he could, but it was a long, difficult trip in an open-aired vehicle. I used my legs as braces, but was still thrown about, sandblasted, and scraped by tree limbs. 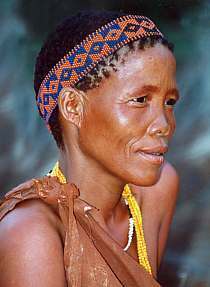 It took all day to get to the camp, but I knew it was worth it all as soon as I saw the San people.